At ISE (Stand 15-S300) event capture/recording and crewless production company Avonic is announcing that it has teamed up with Arbor Media to help deliver a complete digital conferencing solution. 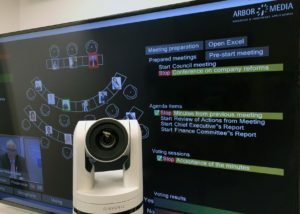 The solution sees Avonic’s advanced IP-based PTZ cameras enable real-time viewing in meetings using Arbor Media’s Cmeets. Avonic’s PTZ camera range comprises no fewer than nine models, with feature sets that allow customers to choose exactly the right level of functionality and price for the planned application. Available with 12x, 20x and 30x zoom capability using high quality optical components including glass lenses and Panasonic CMOS sensors, Avonic’s cameras feature one or more of HDMI, USB2.0 and 3G-SDI as outputs. Cmeets is a fully automatic and easy-to-use advanced digital all-in-one conference solution that allows meetings to be prepared, managed and recorded. Software-based, Cmeets offers conferencing solutions to multi-lingual organizations, parliaments, county and city councils, courtrooms and more. Both Arbor Media ( Stands 1-E120 and 1-E125) and Avonic (Stand 15-S300) will showcase this advanced conferencing solution at the ISE Show. With over 10 years’ experience in ProAV, Avonic is headquartered in The Netherlands and is a leading manufacturer of high quality PTZ cameras and an innovative provider of systems for AV event capture and recording and crewless AV production. All our audiovisual solutions are designed for a range of markets including broadcast, education, healthcare, worship, video conferencing, webcast studios, webinars and enterprise video. Our products are differentiated by their pristine image quality, outstanding reliability, ease of integration and affordability, and are backed by our responsive, in-depth service and support. We are represented by a worldwide network that stretches across Europe, the Americas, Africa and Asia. As the European market leader in conference recording and streaming services, Arbor Media has been developing software solutions for more than 25 years for managing, recording, and distributing audio and video to a diverse customer base. Arbor Media offers efficient, user-friendly, state-of-the-art solutions to professional organizations, parliaments, courtrooms and broadcast stations. Its standardized, automatic and easy-to-use software for audiovisual applications, provides meeting tools and management services, compliance and conference recording services, live streaming, video-on-demand, transcription and archiving services.